BRUCloud was presented as a solution for the Slot Booking App. Define a central window to book a time slot for freight delivery or pick up. Request of single or recurrent timeslots for Bookers (freight forwarders). Make timeslots for different cargo types available from Suppliers (ground handlers). Get insight in the occupation of the cargo zone. Facilitates booking process and follow-up. Update personnel planning based on workload. Eliminate peaks and idle times. What are the results until now? Partners see the added value of the Slot Booking Application. 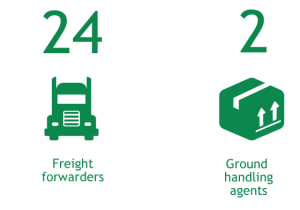 26 partners are using the app, including 24 freight forwarders and 2 ground handling agents. Project partners handle 85% of BRUcargo freight and 50% of all BRUcargo freight is handled via Slot Booking App. 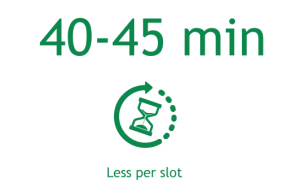 Current findings indicate an average waiting time decreased 40-45 minutes per slot, meaning savings between 60 to 80 dollars per delivery. Further activities related to promotion include new boarding moments for freight forwarder and ground handlers. Testimonials with new users will create more awareness and help to share their experience with the app. Giving demos to other partners will gather more data to get better insights. Two companies will deliver a pilot for the testing phase for trucking companies. Moreover, sharing information and supporting London Heathrow with Slot Booking will help to roll out the app.